RobotJlion – Page 2 – It's not what you look at that matters, it's what you see. We live in a time when the middle class is rapidly disappearing, when the divide between wealthy and not-wealthy is as great as it’s ever been, and when the future appears poised to bring us a bleak landscape of uber-wealthy gated cities separated by sophisticated technology from warring, impoverished multitudes. It’s right out of a Paolo Bacigalupi novel. In case you’re not familiar with them, VAT19 is a retailer of fun and funky things (giant lollypop, giant unicorn lamp) and I know them because my kids love surfing their web site (and watching their videos). This past week my son brought home some math homework. The assignment was, given a list of coordinates, to graph those coordinates. The result would be a picture. 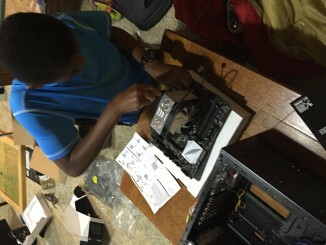 My son recently assembled his own computer. While this isn’t his first computer, it’s the first one he’s put together himself and it’s the best computer in our house (fastest, best video card, most drive space, awesome LED lighting).